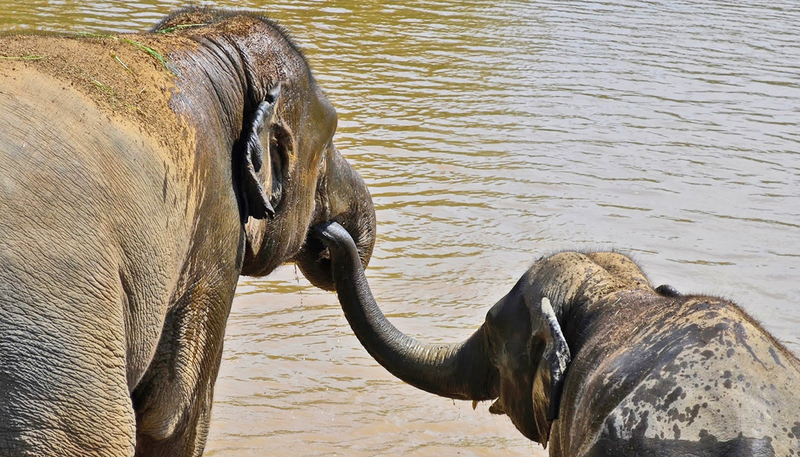 Asian elephants will physically touch and make noises to comfort fellow elephants in distress, a new study shows. The findings are the first empirical evidence of consolation in elephants, says lead author Joshua Plotnik, who began the research as a graduate student of psychology at Emory University. “For centuries, people have observed that elephants seem to be highly intelligent and empathic animals, but as scientists we need to actually test it,” he says. Consolation behavior is rare in the animal kingdom, with empirical evidence previously provided only for the great apes, canines, and certain corvids. 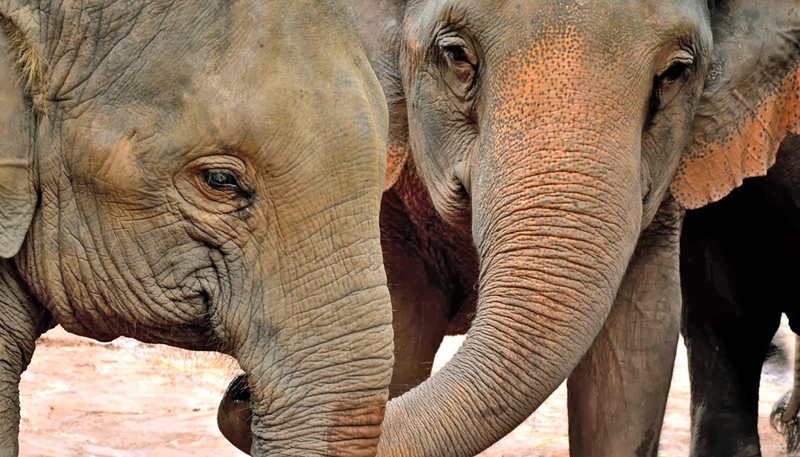 “With their strong social bonds, it’s not surprising that elephants show concern for others,” says co-author Frans de Waal, professor of psychology and director of Living Links at Emory’s Yerkes National Primate Research Center. An earlier study by the researchers provided evidence that elephants can both recognize themselves in a mirror—a test of self-awareness passed only by some apes, dolphins, and magpies—and problem-solve cooperatively. “Humans are unique in many ways, but not in as many ways as we once thought,” Plotnik says. 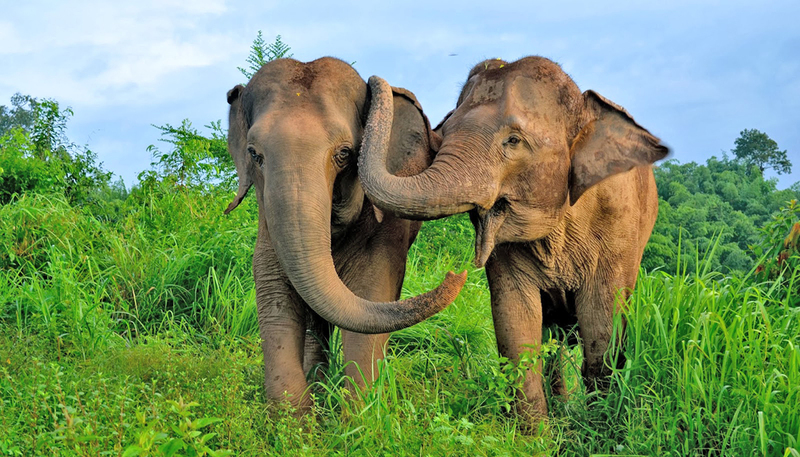 Published in the journal Peer, the current study focuses on a group of 26 captive Asian elephants spread over about 30 acres at an elephant camp in northern Thailand. For nearly a year, the researchers observed and recorded incidences when an elephant displayed a stress reaction, and the responses from other nearby elephants. The initial stress responses came from either unobservable, or obvious, stimuli: events such as a dog walking past, a snake or other potentially dangerous animal rustling the grass, or the presence of another, unfriendly elephant. “When an elephant gets spooked, its ears go out, its tail stands erect or curls out, and it may emit a low-frequency rumble, trumpet, and roar to signal its distress,” Plotnik says. The study found that nearby elephants affiliated significantly more with a distressed individual through directed, physical contact following a stress event than during control periods. As a typical example, a nearby elephant would go to the side of the distressed animal and use its trunk to gently touch its face, or put its trunk in the other animal’s mouth. In addition, elephants frequently responded to the distress signals of other elephants by adopting a similar body or emotional state, a phenomenon known as “emotional contagion,” which may be related to empathy. Groups of nearby elephants also were more likely to bunch together, or make physical contact with each other. Decades ago, de Waal was one of the first to provide evidence of reconciliation in non-human primates, showing how chimpanzees make up with one another after a fight. De Waal’s research also demonstrated consolation behavior: after two chimpanzees fight, a third individual may come over and console the distressed loser of the battle with an embrace. Reconciliation behaviors have since been demonstrated in many more species than those that have shown the capacity for consolation. The current elephant study’s limitations include the fact that it was restricted to captive animals. “This study is a first step,” says Plotnik who received his PhD from Emory in 2010 and is currently a lecturer in conservation biology at Mahidol University in Thailand and CEO of Think Elephants International, a non-profit focused on education and conservation.